Happy belated Mother's Day! This dish is what I made for my mom and The Stallion on Sunday in celebration of Mother's Day. I made it for the first time on a Sunday evening a few weeks ago, and it was fabulous. This time I simplified the recipe a bit because I was cooking on the fly and a few items escaped me. The flavors weren't as complex and developed, but it was still scrumptious - and mom loved it! So don't tell her it was second-rate, mmmkay? Don't let the looks of this dish or the ingredient list fool you - this is super simple. Really. I prepped it within 15 minutes and then went out to deal with a tricky part of the yard while it finished in the oven. Mom's got quite the estate to maintain while the boys are away - 16 acres, about 3-4 of which is kept as your typical yard. The other 12-13 are pasture and hayfield which are mowed with a tractor 2-3 times during the warmer months. This particular section of yard is a bit tricky and quite intimidating as it is a steep hill ending with virtually a sheer drop to the road below. On top of all that, there's a mini spring that keeps the hillside perpetually wet. Don't worry - I took care of it for my mother and emerged unscathed. Even though I had to go over it twice because the grass was so thick and tall. I came back and the roast had been in the oven a bit longer than it probably should have been, but the dish fortunately did not suffer! 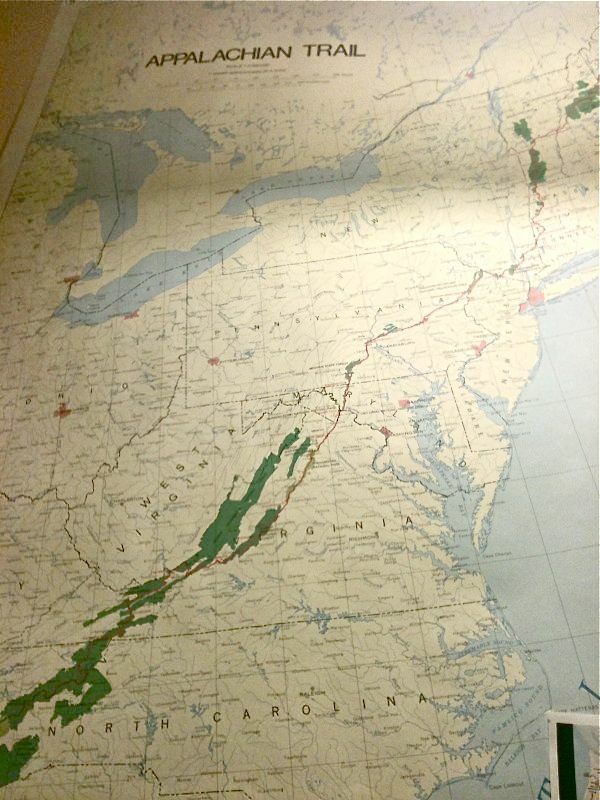 This map has resided on the kitchen wall ever since my father decided to make his journey. As we ate, I looked up at the map, taking in how far they've gone so far. They're now in Virginia - their 4th state. They've traveled over 400 miles on foot - and were just coming off of walking 90 miles in only 4 days. At about a month in, it looks like they're right on track to finish in about 4 1/2 months. Back to dinner. We wrapped it up with some handpicked treats from dolce baking company. Scrumptious. If you're ever there (you might see me) - be sure to get the flourless chocolate espresso torte. Phenomenal. Sounds dense and rich and difficult to eat more than one bite of - but it's not! It's surprisingly light, almost like chocolate mousse. Or the inside of a chocolate truffle. You know - that ultra silky smooth chocolate that is the reason to eat a truffle in the first place? Well, this is virtually all reason with a thin shell. YUM. In a large ovenproof skillet heat the canola oil over high heat - don't use butter as the burning point is much lower. Season the pork all over generously with salt and pepper. Sear the meat until golden brown on all sides, about 2 to 3 minutes per side. Transfer the meat to a plate and set it aside. Add the onion, carrot, celery, garlic, herb sprigs, and 2 tablespoons of the butter to the skillet. Stir until the vegetables are browned, about 8 minutes. 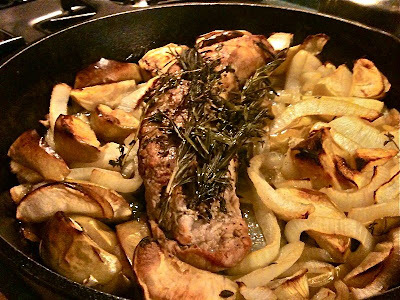 Stir in the sliced apples, then push the mixture to the sides and set the pork loin in the middle of the skillet along with any collected juices on the plate. Transfer the skillet to the oven and roast the loin until an instant-read thermometer inserted into the center of the meat registers 140 to 150 degrees F, about 30 to 35 minutes. This temp. will result in pork that's a little pink, so if you're a medium well to well done person, let it get to 160-165 degrees. I'm a medium rare sorta person myself. Transfer the pork to a cutting board and cover it loosely with foil while you make the sauce. Arrange the apples and vegetables on a your serving dish; set aside and keep warm. Remove and discard the herb sprigs. Return the skillet to a high heat and add the vinegar, scraping the bottom with a wooden spoon to loosen up any browned bits. Reduce by half, then add the cider and reduce by about half again. Pull the skillet from the heat and whisk in the mustard, and the remaining 2 tablespoons of cold butter. Adjust the seasoning with salt and pepper, to taste. Slice the roast into 1/2-inch thick pieces and arrange over the apple mixture. Drizzle some sauce over meat and serve the rest on the side. The first time I made it, I didn't use celery and replaced the apple cider with chicken broth - use what you have!